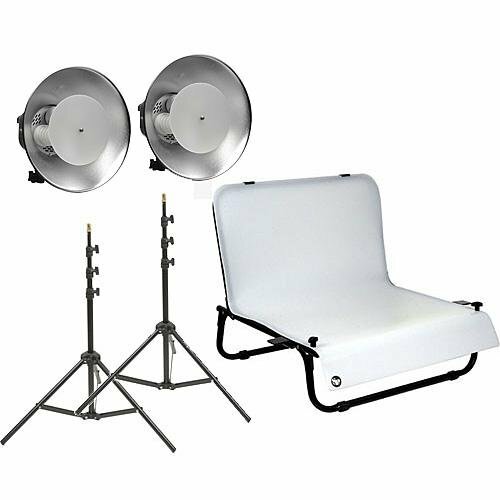 This kit includes two Impact IMVA902 three bulb fluorescent fixtures with bulbs, a small SP Systems shooting table and Impact air cushioned light stands. The Impact VA902 Three Lamp Cool Light is an economical fluorescent head that draws only 90 Watts, yet delivers 4,500 lumens, and is 5500°K daylight balanced without the need for color conversion filters. The included 13" reflector provides a wide, even spread of light, and a diffusion panel (also included) can optionally be used for even softer portrait lighting. The head angle is easily adjusted with its convenient positioning handle and tilting 5/8" light stand mount. It includes a 13' detachable grounded power cord. This is an SP Systems Desktop Shooting Table. It consists of a frame and sheet of white translucent plexiglass. Add your own lights, placing them over, under and around your small subject. Horizontal shooting area: 23.25 x 17". Curved vertical rise: 23.25 x 14.5". Includes 23.25 x 35.5" plexiglass sheet. The aluminum Impact 8' Air-cushioned Light Stand is 4-section light support with sure-twist section locks. If you forget to tighten any section with your light mounted, the light slowly descends, thanks to the air-cushioned action. This useful feature saves equipment and fingers from harm during busy photo sessions.